Editor’s Note: This is a guest post from Elizabeth Ruf, a social media specialist with NC State’s College of Textiles. The post first appeared on the Textiles News page. Aspiring fashion designers at NC State put their design skills to the test at a recent event that married philanthropy and design. In a scene that could have been taken from Project Runway, the students put their lessons into practice, creating dresses out of paper hearts in under four hours. Textile and Apparel, Technology and Management student Zihan Dou took home third place for her dress. The effort was part of Hemline for Hearts, the brainchild of Delisia Matthews, an assistant professor in the university’s Department of Textile and Apparel, Technology and Management (TATM). The project centers on using the red dress symbol of Go Red for Women — the American Heart Association’s national movement to end heart disease and stroke in women. 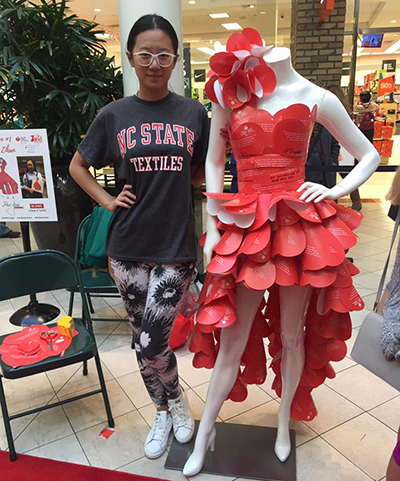 Stationed in a Raleigh shopping center, passersby young and old watched the designers tape, staple and fold their way to beautiful dresses. “I was very glad to see students cultivate creative thinking skills and practice by handling unusual materials,” said Minyoung Suh, another assistant professor in TATM, who was there to watch her students work. The project pulled together students from two TATM courses: Textile Brand Communications and Promotions, taught by Matthews, and Fashion Product Design, taught by Suh. Matthews’ students applied their coursework by developing print advertisements, a social media plan, event marketing and advertising. Fourteen of Suh’s students worked on dress design sketches and crafting their garments out of fabric before practicing with the more rigid paper hearts. Representatives from the American Heart Association assessed the sketches and selected six designs for the live competition. In addition to the human heart, students drew inspiration from the Go Red for Women campaign mission to empower women to take charge of their heart health. 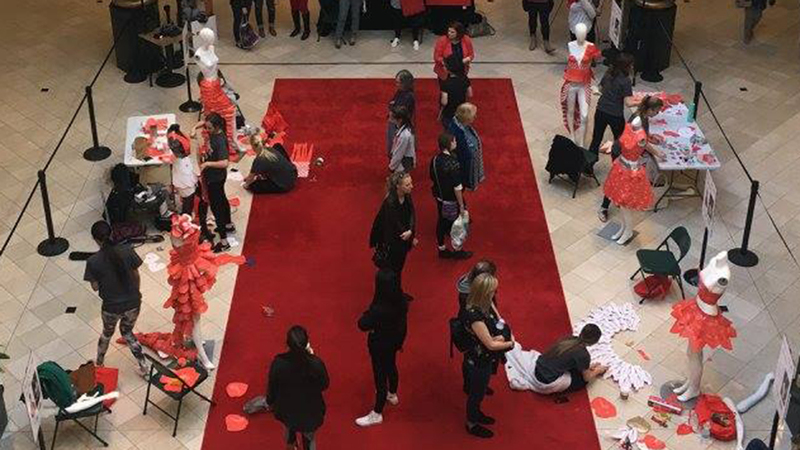 “We were so pleased by the turnout from the public and especially by how many students, friends and families came out to support the designers and learn more about the Go Red For Women Triangle campaign,” said Sloan Garner, regional vice president of marketing and communications for the American Heart Association. “We heard from several people how heart disease and stroke had affected women they love and many pledged to take control of their own heart health. More photos can be found on the College of Textiles Facebook page.